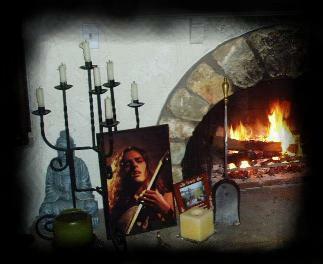 Mrs. Schuldiner, you've been working on the release of Chuck's last masterpiece [the long-awaited sophomore CONTROL DENIED album] for a long time. There've been years and years. What does make you believe that this project will see the light of day? If you have read the history of the fight for Chuck's rights to have his album done his way, the way he created it and not have it bastardized, then you know the answer to the question. He asked for the promise from his sister, Beth, that she see to his vision for the last work he was ever going to do. And it has taken this long through much legal work and money to finally get control and to be able to start gathering and planning for the album. Years it may have taken, but we prefer to say we have kept the promise to Chuck, nothing else matters. Great! Good news. Well, but have you ever felt it wouldn't be possible to release this album? Releasing it was not the point, releasing it and making sure of the integrity of the album was/is most important. If it could not be done the way Chuck asked, it wouldn't be done at all. That was the question, and it has been answered. It will be done, and exactly as Chuck asked. I would feel absolute dejection if that work was not released, only I was there to see the condition he was in as Chuck struggled to finish what he could, and all the time while seeing to his wishes that it be done as he asked. Well, there will be an announcement any day now by the label who was chosen to see it completed. What would you say about the participation of the musicians involved in this project? The musicians involved were not only the best of the best that Chuck chose himself, they were friends of many years there also. Steve [DiGiorgio], for instance, was one of Chuck's best friends from the beginning of his career. Richard Christy is another friend who has stayed in touch with us these past years. Very supportive and very dear to us, as he was to Chuck. Did you have any failed attempts in trying to get [certain other] musicians and former DEATH members that could help you out with this project? The musicians are very supportive, as they have always been. They honor Chuck by being there, as true friends would be, as he would be were the roles reversed. You have to try to understand that what to you and others is "many" years, when you have a project that is so important to the person creating this work, it is not an "old" project, it's an ongoing project. There is no time frame for such projects, and whenever it is finished, it will be a wonderful tribute. Can you tell us all the musicians involved in this project and which songs would be featured on the album? Richard, Steve, Shannon, and Tim are the ones involved, the songs were written by Chuck and I don't know the details. What would you say about DEATH's current fan base? Is there [a lot of new fans who have been introduced to DEATH's music in recent years]? I still receive an amazing number of e-mails from Chuck's loyal fans all over the world who write to me, remembering Chuck, plus e-mails from another generation of fans out there, from 11 years old. They became familiar with Chuck's music from friends, sometimes from their parents who introduced them. I recently received another wonderful painting from a fan from Germany and it's on an easel in my living room. I receive Mother's Day flowers and cards, on Chuck's birthday they are there, and on December 13, 2001 they never forget. Even my birthday! They're there, as always. Besides members of the bands Chuck'd been in, which would you say that were his best friends on the metal scene? I never heard him speak of a deep friendship with other bands, though Chuck really admired other bands and said often what a fan he was. He had many friends on the metal scene, but the closest were Steve and Richard, who happened to be in the DEATH and CONTROL DENIED bands. We all know that some "outsiders" do see metal as drug-related movement. Chuck Schuldiner, on the other side, was openly against hard drugs. Did he ever do drugs? What was on this with your children? People would be wrong to think that of metal music, or metal people. I worked at a school involved with teenagers who were in a live-in drug treatment program, and the Juvenile Justice Program where young people were incarcerated. As usual when I worked with the young people, I was very involved in helping them, and became fond of them. Some I still have contact with. And, when my children became old enough, very early teens, I took them for a tour of the programs, and assured them that if they were to ever become involved with drugs, this is where they would be. They believed me, as they should have. I'm not sure about your faith and beliefs. However, is there something religious or mystical that makes you feel closer to your son? I remember well all the times when Chuck was hospitalized, the ministers at the hospital would come to see Chuck and they all asked about his beliefs. He told them he was a spiritual person. As I am. He believed a person's beliefs were personal, as I do. I am comforted in my belief that both of my sons are together, and near me. Is there something you wish you could have made different to Chuck? I have no regrets about how good a mother I was, my children have always made me sure I was a good mom, but as illogical as it might be, I wonder so many times, so often, that if we had not moved to Florida, which was my choice, that maybe it would have been different, that maybe that tumor would not have become active. That will always be my burden, I'm afraid. The if onlys. I know it would make Chuck proud that we, his family, have gone on as best we can since the loss of him in our lives, as I promised him we would, and having lived through our grief when his brother died so young, he knew it would be so much worse when he followed him. He worried about us. And Chuck would be very, very proud that he is remembered by so many fans, and that they write often to me to let me know. And that his music, his legacy, goes on. He made a difference in many lives with his lyrics, which many say gave them hope when they despaired. The dishonest record labels, dishonest people. He feared dying far from home, I learned that from an interview sent to me by a fan. There was an incident in Europe that killed a musician when the bus the band was in went over a cliff. It was very upsetting to Chuck that the musician died far from his home. I went to Chuck's nephew, Christopher, for the answer to this one. IRON MAIDEN, ANVIL, VENOM, KISS, JUDAS PRIEST. Other than his family and pets, his guitar was just about the most important thing in his life, it was almost a part of him. He was almost never without it, and took it everywhere with him. Even when he could not play, it was near him. It was very therapeutic at the beginning, he told me. Then his lyrics were a statement of his personal experiences as well as injustices he saw all around him, "Leprosy", for example. He was horrified when he became aware of the way people with that disease were treated, and "Symbolic" was very personal. As time went on, his music became an integral part of Chuck's life and he referred to the music and all it involved, musicians, fans, etc. as his metal family, Chuck felt close to them. He often said that music is an international language. He love that about it. Chuck said if he could just play his guitar for the fans with no labels involved, he would be a happy man. This probably didn't answer the question, really, but it was just a part of him. To the very-young metal fans, what do you believe that Chuck would say or what would be his advice to them? He would tell them to stay true to themselves, to persevere through disappointments. I conducted a poll with over 300 guitarists back in 2008. Chuck Schuldiner was picked the 35th-favorite guitarist of the guitarists themselves. As a metal icon, Chuck had already been awarded many times. However, I feel that some people do only see the icon in Chuck and do not recognize his greatness as a musician and guitarist. What do the results of this poll mean to you? Some people probably do feel that way, but his peers did not, and his fans write and tell me how he still is an inspiration to them. I think the results of the poll means that he was acknowledged as one of the best. No small thing!!! Chuck would be very proud of that honor. I know I am, and I thank you for letting me know that. Last... What would be your advice to the parents of young-metal musicians playing guitar, practicing, wearing black t-shirts, listening to heavy metal music and probably being seen by adults, teachers, schools, etc., as "dangerous," "potential outlaws," "society outsiders,""wild child?" I receive many e-mails from young metal musicians with that problem, and some moms. I say to them that when my son became interested in the music, when even our mailman worried a bit, I supported him in his choice. Chuck acknowledged that in a magazine interview. It never occurred to me not to, maybe because there were no signs of anything except a deep interest in music, maybe not my interest at the time, but I respected his choice. It should be that simple to parents, this is their children's music choice, as Elvis was ours, and our parents worried also. What they wear, the color of the clothes, their hair, that's not something to worry about, their behavior is what to look for. I always knew where Chuck was, and so did all the other parents in our neighborhood know where their children were, they were all in my garage with Chuck. I fed them snacks and drinks — nonalcoholic! — and missed them all when Chuck went off to seek his future. One of the best times of my life, those young people. It could be theirs too, and will forge a deep bond with their children.